In France, cheese is served as a dessert—carry on that delicious custom with these crunchy, brie-filled pastries. Balsamic ReductionIn large saucepan, combine sugar, vinegar, and dried figs; bring to boil over medium-high heat. Reduce heat and simmer 30 minutes. Strain and discard figs. Return liquid to saucepan; simmer gently over low heat until reduced to 1/2 cup. Transfer to squeeze bottle and chill. Pistachio ButterReserve 2 tablespoons pistachios and combine remainder with clarified butter in blender or food processor. Pulse on high until smooth. Add sugar and season with salt and pepper. Set aside. Baked BriePreheat oven to 350°F. Brush phyllo sheets with melted butter; stack and cut into quarters. Divide wheel of Brie into quarters and place one quarter, bottom up, in center of each square. Fold phyllo up and over Brie, to fit tightly. Trim and seal phyllo. Heat vegetable oil in non-stick skillet and lightly brown wrapped Brie on all sides. Transfer to baking sheet, seam side down, and bake at 350°F for 8 to 10 minutes. Season figs with salt and pepper; grill until warmed through. To serve, warm Pistachio Butter in microwave and spoon 1 1/2 tablespoons onto serving plates. Arrange Baked Brie and two grilled fig halves in center and sprinkle with reserved pistachios. 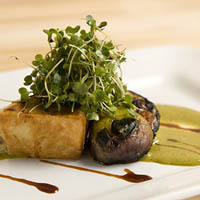 Drizzle Balsamic Reduction over all and garnish with watercress.